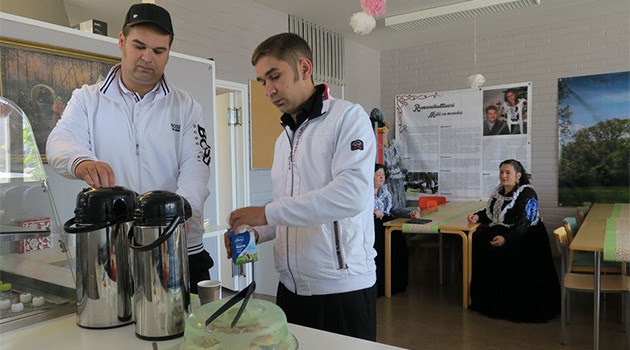 News server Yle reports that in mid-June the National Romani Forum in Finland announced that a business called Café Rom in the town of Kotka had become the first restaurant in the country to be owned and managed by local Romani people. Café Rom is located in an old portside cafeteria in Hovinsaari district. The logo of Café Rom is the Romani flag adopted at the first World Roma Congress in 1971. The interior features banners with information about Romani culture and history. Allan Bollström, chair of the local Kaakonkulma Romani association, said Café Rom is a place that breaks down prejudices and stereotypes about Romani people. "There are entrenched stereotypes about Romani people, for centuries they have been rumored to be lazy and violent. Café Rom is here to demonstrate to our customers that we are citizens of Finland who are normal. All are welcome here," he said, describing Café Rom as a bridge between the majority population and Romani people. "Disinformation and prejudices about us still exist," he said. "Café Rom is the key to our being able to change that. We are prepared to answer all questions that our customers might have." Racism against Romani people is still common in Finland. Recent events there have reminded the community of that fact. In May a gas station in the town of Vantaa refused to sell fuel to a Romani family. At the beginning of June a barman in the Iltakoulu restaurant in Helsinki refused to serve Romani people there. Dimitri Lindeman, a Romani man from the coastal city of Hamina, is a student of management and currently one of Café Rom's three employees. "Security guards in shops always follow us around and sometimes won't even let us in some places," he said. The situation in the country, according to Lindeman, is improving, though, and many locations are noting a decline in such discrimination. An estimated 10 000 Romani people live in Finland.